I love Ewan McGregor as an actor. Trainspotting, Moulin Rouge, Beginners, I Love You Philip Morris, the upcoming Beauty & the Beast. But I admit to being taken aback when I learned McGregor was making his directorial debut with an adaptation of Philip Roth’s Pulitzer Prize winning American Pastoral. The book, not a favorite of mine as it dives deeply into darkness, is not just physically long at 435 pages, it is a long and winding road, encompassing such a massive amount of territory and thought that it would be a challenge for an accomplished director of the likes of Martin Scorsese to pull off. From what I hear, Ewan McGregor might have, as the old saying goes, bitten off more than he could chew. I haven’t seen it, and I mean to do just that as it’s playing in theaters now. In the meantime, I want to share this review from Alissa Wilkinson at VOX which understands both the novel and the film and weighs in on where McGregor fell short. It’s worth the read. 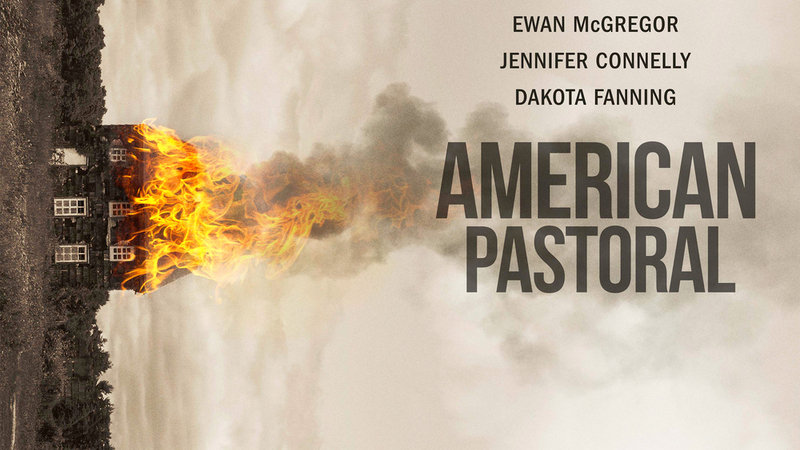 Have you seen American Pastoral yet? Do you agree? “Philip Roth’s American Pastoral is about a country mythologizing itself. The movie misses the point. In his directorial debut, Ewan McGregor takes a crack at the Pulitzer-winning novel. Philip Roth’s Pulitzer-winning novel American Pastoral is the story of an all-American family man who watches his family crumble during the turbulent 1960s, when his daughter is accused of bombing the local post office in their staid town of Old Rimrock, New Jersey. The book’s protagonist is Seymour "the Swede" Levov, a former high school star athlete from Newark who married Miss New Jersey. They had a daughter, Merry, and she had a stutter — and also, eventually, a grudge against everything her good-looking, comfortable suburban parents stood for. But in translating the book to the screen, screenwriter John Romano and first-time director Ewan McGregor more or less omit Zuckerman, who is the novel’s key element. The character is still there, but his purpose has been stripped away. And in changing Zuckerman’s role in the novel, the film misses what American Pastoral is really about. In the novel American Pastoral, Zuckerman has returned to his Newark high school, Weequahic High, for his 45th high school reunion when he runs into the Swede’s brother, Jerry, who tells him that his brother has died. Zuckerman, along with everyone else in the town, had idolized the Swede as the embodiment of the American dream: Jewish, but also tall and blonde (hence the nickname), a star athlete, a Marine, a college man who married a shiksa who was also Miss New Jersey, and took over his father’s ladies’ glove manufacturing business. The rest of the book is the story of the Swede, partly pieced together from facts gathered by Zuckerman and partly, or even mostly, the product of Zuckerman’s imagination, a wild guess at how bright American promise can go so sour. When Merry is a teenager in 1968, angry at the world and finding her focus in being angry about the war, she plants a bomb in the town’s post office, which kills a man. She goes into hiding, and the Swede frantically tries to track her down for years before locating her living in squalor in Newark. But that’s only the catalyst in the Swede’s crumbling life. In her New York Times review of the novel in 1997, Michiko Kakutani wrote that "with the story of Seymour (Swede) Levov, Mr. Roth has chronicled the rise and fall of one man's fortunes and in doing so created a resonant parable of American innocence and disillusion." To be sure, American Pastoral portrays America’s stagger into the late 20th century by way of one man’s tragedy. But because Roth lets Zuckerman narrate the story, the Swede’s tale gets all mixed up with Zuckerman’s nostalgia. He imagines how his childhood hero, the embodiment of everything good for him and his town, could fall into such tragedy. He fictionalizes the story by necessity. And thus, the Swede’s life avoids becoming a strained metaphor. It also becomes about a country’s collective pining for a past that’s part factual, part mythical. Of course that was relevant in the 1990s, when the novel was published, but it's even more so today, with a major portion of the country yearning for a former golden age when America was great. So it’s unfortunate that the big-screen adaptation of American Pastoral doesn’t capture this aspect of the story. It captures the plot, insofar as we see the events of the Swede’s life unfold. McGregor plays the Swede as he marries Miss New Jersey, a.k.a. Dawn (Jennifer Connolly), and they have a daughter, Merry (played at various ages by Ocean James, Hannah Nordberg, and Dakota Fanning). They buy their house in the New Jersey countryside and the Swede runs the glove factory in Newark, aided by Vicky (Uzo Aduba), and grapples with tragedy as it comes to him. Zuckerman is still in the story, played by David Strathairn, but now the film gives the impression that he’s merely there to bump into Jerry Levov (Rupert Evans) and listen as Jerry tells him the whole story. It’s pretty much all here, and the scenes of the Levov family’s life and slow decay are directed serviceably enough by McGregor. It’s all set against a stylized backdrop that shifts gradually from brightly lit, bucolic scenes of rural life to something much darker and frightening. By the end, even the domestic scenes feel sinister, like the rug has been ripped out from under the Swede. And yet the movie feels flat and small, lacking the novel’s energy and expansive ambition. American Pastoral’s plot is engaging enough, but it has the quality of theater, all manners and long conversations without a clear sense of what it’s getting at. Without Zuckerman’s narrative voice, the mythmaking is gone. Admittedly, it would be hard to make a version of American Pastoral that captures the book’s story-within-a-story structure. But American Pastoral without the overriding nostalgia is a tragedy without the lament, and the novel Roth wrote has both. The screenplay by Romano (The Lincoln Lawyer, Intolerable Cruelty) could have conceivably found a way to capture both the book’s plot and its tone, but this one is a misstep, and fundamentally doesn’t understand its source material. This type of thinking — the idea that by accurately capturing elements of a book’s plot, you’ve adapted it to film — isn’t all that uncommon; audiences’ fixation on "not changing the book" doesn’t help. Understandably, people are attached to their favorite scenes, lines, and characters from novels. (Nobody wanted to lose Tom Bombadil in The Lord of the Rings.) But novels are longform storytelling, with much more space to fill out a story and the flexibility to switch narrators, allow a lot of time to pass, and let readers into the inner lives of characters by listening to their thoughts from a first-person point of view. The language of cinema is much less yielding to this: Cinematic storytelling relies on not just the plot elements but also visual and aural elements, and all in a time span that’s much shorter than the average novel. So you have to change the book to make it a movie, because books are not movies. Books and movies are about more than their plots — which seems obvious but is easy to forget. They’re about how their plots are recounted, using the tools of the medium at hand, whether it’s prose or cinema. The Chronicles of Narnia: The Lion, the Witch, and the Wardrobe is a fine trot through the plot of the book but failed as a movie because it missed the dark, even frightening tone, and rendered Aslan onscreen as more of a very large lion-shaped cat rather than a giant, unsafe lion. No Country for Old Men succeeds not because it translates every one of Sheriff Ed Tom Bell’s speeches to the screen, but because it gets the spirit of the speeches and the ominous lumbering of evil personified just right. In the case of American Pastoral, the filmmakers did change the book, recognizing the challenge of translating Zuckerman’s imaginations onto the screen. But instead of figuring out how to render that same effect cinematically — perhaps by letting Zuckerman become a more prominent onscreen character, not less — the film effectively cuts Zuckerman out altogether, and with him goes the book’s sense of our collective responsibility for how we tell and remember our history.